I just love JulieHRR's gallery on SCS . Make sure to check it out if you haven't already. She was the featured stamper yesterday, and I couldn't do the challenge just once! This is the card that inspired me to create this card. I also posted this card in on my SCS gallery, so you might have seen it there. Thank you all for your kind comments on it. It really means a lot to me, since it is my dear husbands art that I used. He is working on a few more pictures for me. He draws whenever he has some spare time, usually superhero comic stuff . I asked him to draw several images for me, this is the first one to be finished. He had it done in no time at all. I scanned it on my computer and printed it out. And the best thing is, I could use my copic and prisma markers to color the image. I wasn't sure if the computer ink is going to work with them or not. The edges were sponged with bashful blue ink and adhered to the basic black scallop rectangle (nestabilities). The strip of designer paper is by SU (bashful prints DP). I applied stickles to the centers of all the little flowers. This was adhered to basic black. The card base is bashful blue. I added some paper piercing to that. The main image was mounted with dimensionals. To finish the card off, I added the 2 flowers with a brad, stamped the sentiment and added some stickles to the leafs, birds and the white flower, and adhered a little bit of grosgrain ribbon to the branch. Your husband is amazing!!! He should definitely turn his art to stamps! I love the bird image. Such darlings. Your coloring is awesome. And yes, I am, too, a die-hard fan of JulieHRR. Have a great day! Adorable image... you've got one talented hubby, there! Love the soft colors and clean layout. Oooh, this is so pretty and lovin' the blue! excellent job!!! You have a very talented husband! 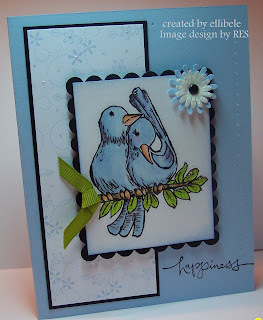 This is such a pretty card and your colouring is fab. This is so, so pretty! Fabulous image, TFS!